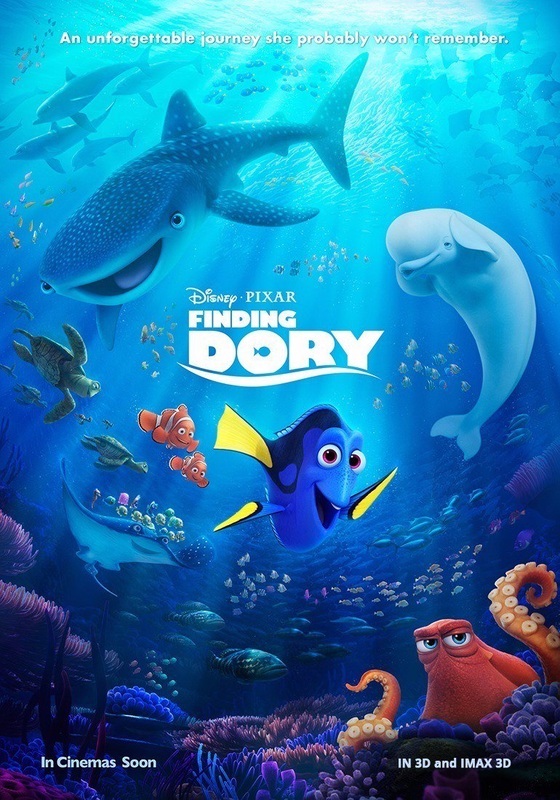 Synopsis: Set one year after the events of Finding Nemo, Dory begins to get flashbacks about her past and her parents. Determined to find answers, she sets off on a quest to reunite with her long lost family. Review: It has been thirteen years since we were introduced to a bunch of lovable fish that swam their way into the hearts of audiences in Finding Nemo. It could be argued that of those group of fish, there was one who perhaps swam her way into the hearts and minds of viewers more than most, this of course being the blue tang Dory. So of course it was only natural that this phenomenal piece of storytelling would get a sequel. Sequels for Pixar are generally a mixed bag, for every Toy Story 3, there’s a Cars 2. However, given Dory’s immense popularity, the head honchos of Pixar decided to make this movie about her, and what an inspired decision that turned out to be. Nemo director Stanton, along with Angus MacLane, with a scripted penned by Stanton and Victoria Strouse take us back to the big blue, and one year after Dory has helped Marlin reunite with Nemo after the latter went somewhat astray. Seemingly content with life, and still a bit forgetful, she begins to have flashbacks about her past and believing that somewhere out there she has a family, Dory goes off on her own adventure with Marlin and Nemo in tow. Pixar certainly knows how to give its audiences full on emotional punches, as last year’s brilliant Inside Out demonstrated, and once again, they have delivered a heartfelt worthwhile story with a great new batch of characters and a script that is packed with plenty of laughs. Once again, Ellen DeGeneres is on outstanding form as Dory, her humour ensured she was one of the funniest movie sidekicks of the 2000s but now she is front and centre and she absolutely holds her own. Brooks returning as Marlin is his usual somewhat grump self and Hayden Rolence replaces Alexander Gould as the voice of Nemo. Adding them on their quest are a great bunch of new characters, the standout by far though is Ed O’Neill’s Hank the Octopus. He may be a bit grumpy too, but he certainly adds a lot of humour to the story. Ty Burrell as a beluga whale and Kaitlin Olsen as a clumsy whale also add a great deal to the plot. The seagulls were another highlight of Nemo, yet they have been replaced by a pair of equally amusing sea lions voiced by Idris Elba and Dominic West. Pixar has certainly shown in the past that they’re not afraid to go deep (pun absolutely intended) with their films. They tug at your emotional heart-string and it’s one of the many reasons why they have cemented their reputation as an animation powerhouse. There is no real villain here, but it’s not a hindrance to the plot in any way, as the struggles of family life and finding your place in the world are themes that almost anyone out there can resonate with. A debate could rage all day about whether Pixar or parent company Disney make the better movies. However it cannot be argued that both have put out tremendous pieces of work so far this year, and both of these are centred around animals. This particular Pixar sequel was not out of its depth, but instead swam its way to success, and that bodes well for the sequels that are currently in the works. The price of a ticket is worth it if just to see perhaps the cutest animated short you will ever see in your life too. Pixar produces another superb piece of storytelling, beautiful animation, with more well developed characters, and another superb performance from DeGeneres, a worthy sequel to Finding Nemo.